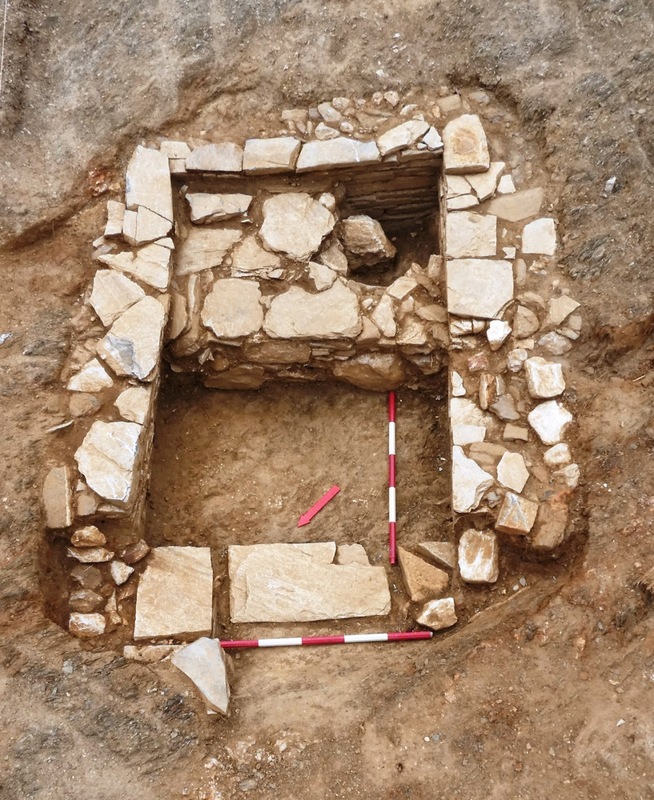 A cemetery was excavated this summer by the Ephorate of Antiquities of Euboea at the site Makria Rachi of Karavos in Aliveri. This proved to be a real palimpsest in terms of the region’s archaeological data, since during a rescue survey carried out on a private plot of land, it was found that the cemetery had been in continuous use for over 2,500 years. 1. An unplundered shaft grave of monumental construction belonging to the Early Helladic IIB era (Lefkandi I phase–Kastri 2400-2300 BC). The floor was strewn with river sand and its interior, during its second phase, had been divided by a transverse wall into two sections. 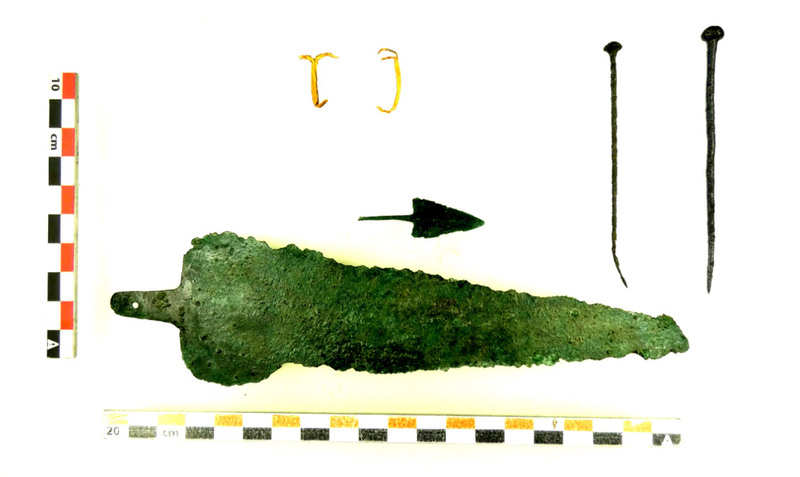 A secondary burial was located in the east section, containing grave goods of a pair of gold earrings, one silver and two bronze ornamental pins. Αn in situ burial in the foetal/contracted position was discovered in the west section, with grave goods of a bronze dagger, an arrow head and a polished spherical prochous with a beaked spout. The head of a marble Cycladic figurine of the Louros type (3200-2800 BC) was discovered a short distance from the grave. 2. An unplundered chamber tomb of the Late Helladic IIIB-C era (1300-1100 BC) with a chamber diameter of 2.40m and a corridor length of 7.50m. 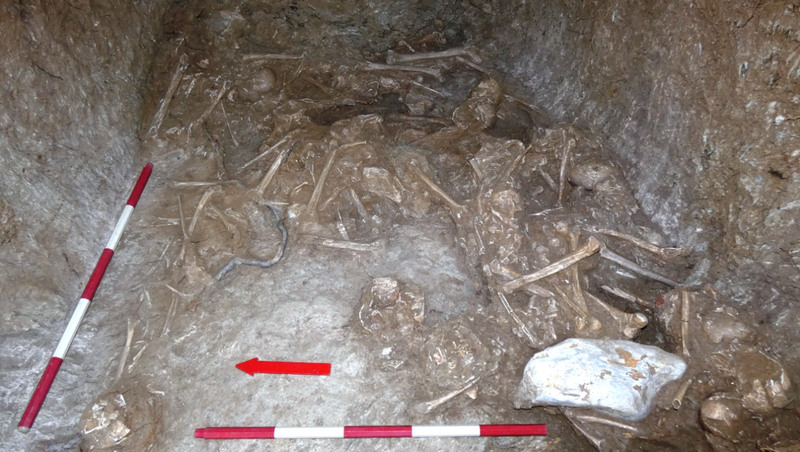 It contained 11 retrieval burials and one in situ. 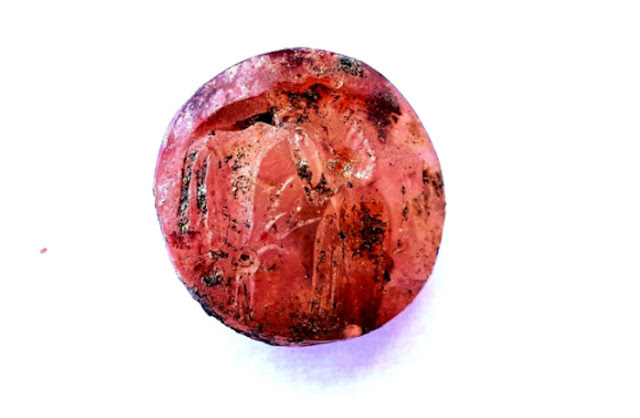 Inside it were discovered 6 intact and at least 7 more fragmented vases, mainly stirrup jars, alabastra, prochoi and cups, a bronze ornamental pin, 53 loom weights of steatite, stone beads, elaborate ivory buttons and three seals of great artistic value. In Roman times, part of the tomb’s roof collapsed and was used as a depositor without the lower burial layers being disturbed. Many animal bones came from the upper layers as well as pieces of vases from the Roman period (1st-3rd century AD). 3. 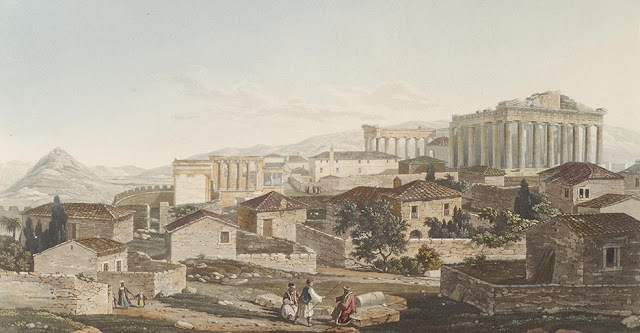 In all, 24 more graves were investigated on the same plot of land, consisting of one jar burial and a cremation of the Late Classical (end of 4th c. BC), Hellenistic (3rd-1st c. B.C.) and Roman times (1st-3rd c. A.D.), in clusters of 2 to 4 graves. Seven of the graves belong to the tiled roof hut type, 16 to the simple pit grave covered by rough slabs and one is a built shaft grave of the Roman era. The following artefacts have been unearthed from them: a gold earring, an ornamental bone pin, bronze coins, black glazed miniature vases of the 4th century BC, such as lekythia, a pyxis, a clay statuette of a pig, an unpainted trefoil oinochoe and a prochous of the Roman era. 4. Lastly, an underground rock hewn and partially built water conduit of the Roman era was located, that runs across the cemetery in a NE to SW direction for a length of almost 25 m and very probably supplied water to the adjacent bath house of the early Christian era. 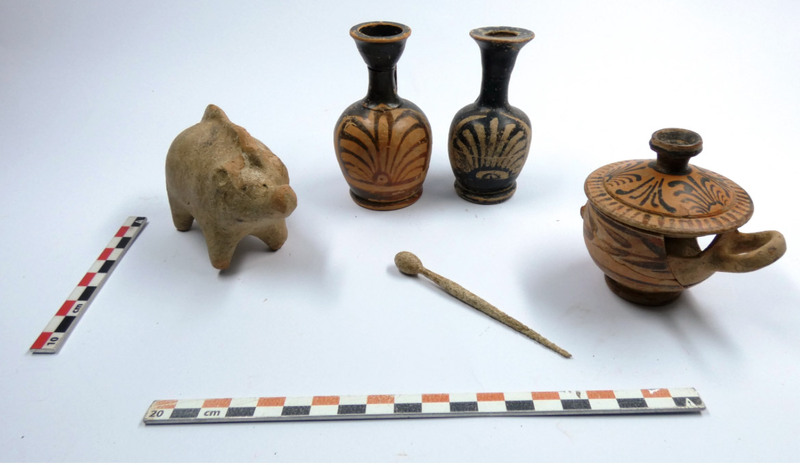 This year’s excavation provides valuable information about the inhabitants of the settlement that was excavated while the new factory of the Public Power Company of Greece was being built in the same region between 2007 and 2014. 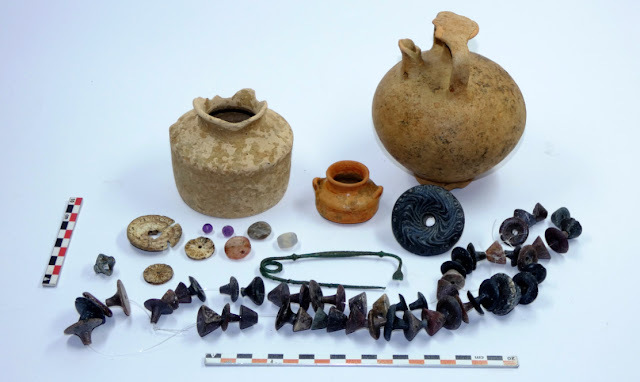 The grave goods that were studied from inside the tombs show that the inhabitants of the coastal settlement of Karavos, Aliveri, by making good use of their natural harbour had developed significant trading relations with the mainland and the islands. 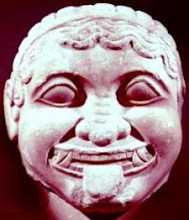 In the Mycenaean era, these relations reached as far as Crete. The excavation, which continues, is reaching its end. 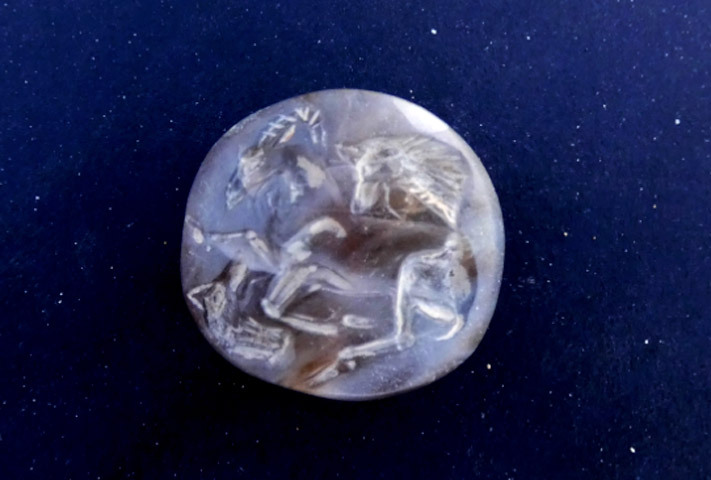 It is headed by archaeologist Konstantinos Boukaras of the Ephorate of Antiquities of Euboea, while the conservation of the findings is being conducted by Fotini Popoli and Georgia Kageli, conservators of antiquities.